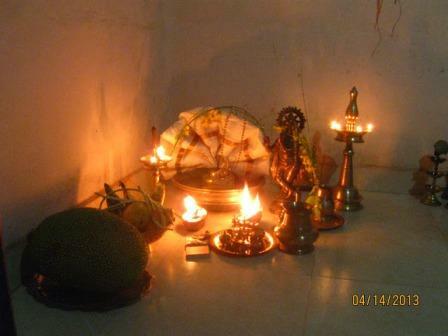 Festival Vishu is the New Year festival of Kerala. In Kerala, according to the position of stars and planets, the auspicious time of the new year is decided. During this time, the sun crosses the equator and enters into Aries, Ashwini nakshatra, and Zodaic New Year is started, which is celebrated as Vishu. It is also the first day of Malayalam month Medam. Special prayers are chanted during that time, to make the coming year happy and prosperous. Usually Kerala festival Vishu falls on April 14th. People of Kerala celebrate this auspicious festival with many colorful rituals and customs. Among the customs, Vishukkani is the most important part. The people start their day by seeing this Vishukkani, as their first sight. New Year greetings are exchanged between the people. Vishukkani - The lady of the house keeps some auspicious items in an uruli, a circular metal vessel, in the family pooja room. A traditional uruli is made of panchaloham, which is the symbolic of the universe. The auspicious items include rice, cereals, coconut, gold ornament, new cloth, vegetables like cucumber, mangoes with leaves, jackfruit, betel leaves, arecanut, fruits, along with the golden color flowers of Konna tree (cassia fistula). An image of Lord Krishna , the preserver of creation is kept behind the uruli. A nilavilakku (a traditional brass lamp of Kerala)is kept near the uruli. Next to it Bhagavat Gita is also kept. A well-starched cloth is pleated like a fan is inserted into a kindi (a spouted brass vessel specially used for pouring sacred water) and kept on top of the rice. A val kannadi, a special mirror, is then inserted into the kindi. Two deepams are placed in the coconut halves, and kept in front of the uruli. At dawn, the lady gets up and lights the lamp and the deepams in the coconut halves, and prays for her family to have a bright and happy new year. Lighting the deepam is symbolic of removing the darkness of ignorance and bringing spiritual knowledge. She wakes up her husband and children and other members in the family and invites them to have the glorious darshan of God in Vishukkani, as their first sight of the year, and pray the Almighty for a bright new year. It is believed that those who see the Vishukkani in the early morning as their first sight, they will have a year of abundance, both spiritually and materially. Hence, Kerala festival Vishu is very important for the people of Kerala. The actual meaning of kani is "which is seen first" and since it is the festival Vishu, it is called Vishukkani. The next ritual is giving vishukkaineettam (distribution of wealth) by the head of the family to other members of the family and other dependents. It is believed that vishukkaineettam should be given freely and accepted with reverence. As a part of welcoming the new year, Bhagavat Gita is read by the family members. On this day of Kerala Festival Vishu, special poojas are held in many famous temples like Guruvayur, Ambalapuzha, Sabarimala etc. Young children engage in bursting crackers to welcome the new year. Like any other festival, people celebrate Vishu with new clothes and a grand lunch, called sadhya. Apart from Kerala, this festival is celebrated in other parts of the country with different names, like Bisu, Puthendu etc. Want to know more about the significance of Vishu? Check this page.